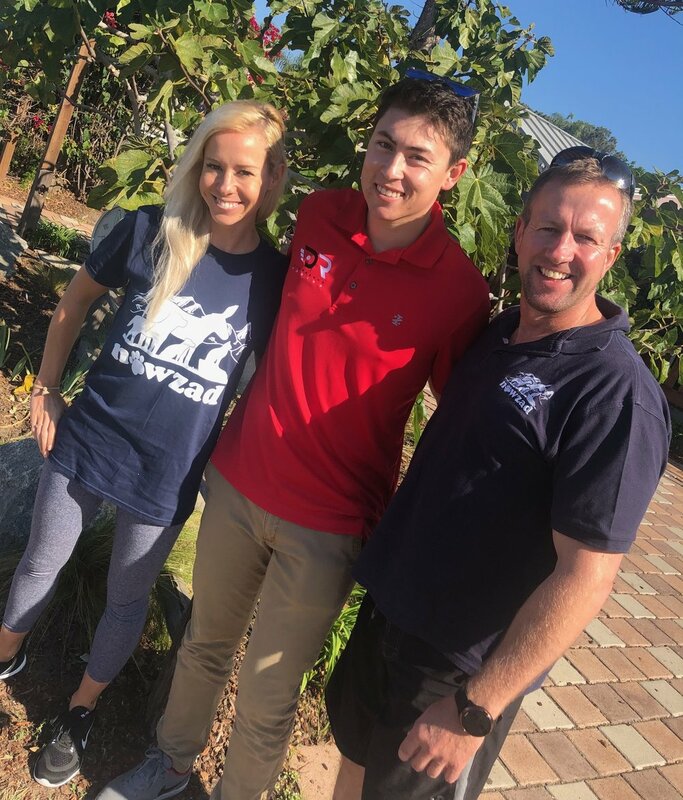 San Diego, CA (November 27, 2018) – For the past several years, Dakota Dickerson Racing has supported two charities that he holds dear to his heart, Shelter to Soldier and Nowzad. Both groups work with military veterans and with rescue animals but in different ways. The young driver has always had a strong connection to the military and as an owner of rescue dogs himself, he wanted to use his racing platform to help raise funds and awareness for these two organizations. Two supporters of Shelter to Soldier with Dakota at Laguna Seca. Shelter to Soldier’s motto is Saving Lives, Two at a Time. Their mission is to bring post 9/11 combat veterans together with professionally trained rescue dogs to help both recover and move forward from post-traumatic stress disorder, traumatic brain injury or other psychological injuries associated with traumatic service experiences. Graham Bloem, Founder, President and Director of San Diego based Specialty Dog Training and Shelter to Soldier, has been training dogs professionally for over 15 years. He has a true understanding of dog behavior and is passionate about animal rescue and giving back to men and women in uniform. Since becoming involved with Shelter to Soldier, Dakota most recently donated some of his racing equipment and a race weekend experience for a raffle by Shelter to Soldier at their annual Gala held in San Diego. 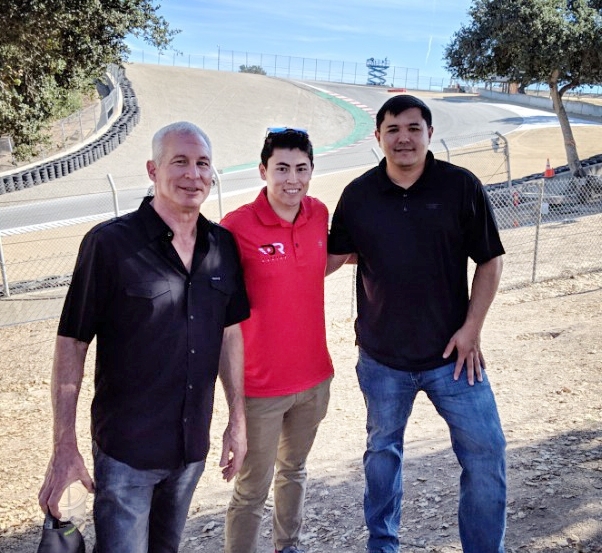 The prize package was well received and as such, Dakota was able to spend time with two supporters of Shelter to Soldier during the Intercontinental GT Challenge race in Monterey, CA this past month. The Nowzad connection is as follows. With Pen and Hanna, founders of Nowzad. Nowzad operates and manages the only animal sanctuary in the Afghanistan area. They care for and nurture animals that have been hurt or abused. They also deliver educational seminars to the Afghanistan locals on how to properly care for the animals. In addition to this, brave men and women serving in a war zone find themselves adopting stray cats and dogs that are struggling to survive there. The soldiers are not only a salvation for the animals, these animals are a lifeline to the soldiers, providing a respite from war, a moment of peace and home and love. When the soldier’s tour of duty comes to an end, it is unthinkable to leave their four-legged comrade homeless. This is where Nowzad steps in to help. They arrange legal and safe passage for the animals to be reunited with the service men and women after their time in Afghanistan has ended. Dickerson ran a fundraiser for Nowzad during rounds 13-15 of the F4 US Championship. People from around the world donated to Nowzad and were able to put their furry loved one’s name on Dickerson’s helmet and Formula 4 car. He was able to raise over $1,300 and later met with founders, Pen and Hanna, in San Diego to go over future plans. Dakota proudly wears the logos of his two favorite charities. Dakota Dickerson is a third generation racer from San Diego, CA. The 21 year old has been racing since he was 6 years old and recently won the 2018 F4 US Championship with DC Autosport. 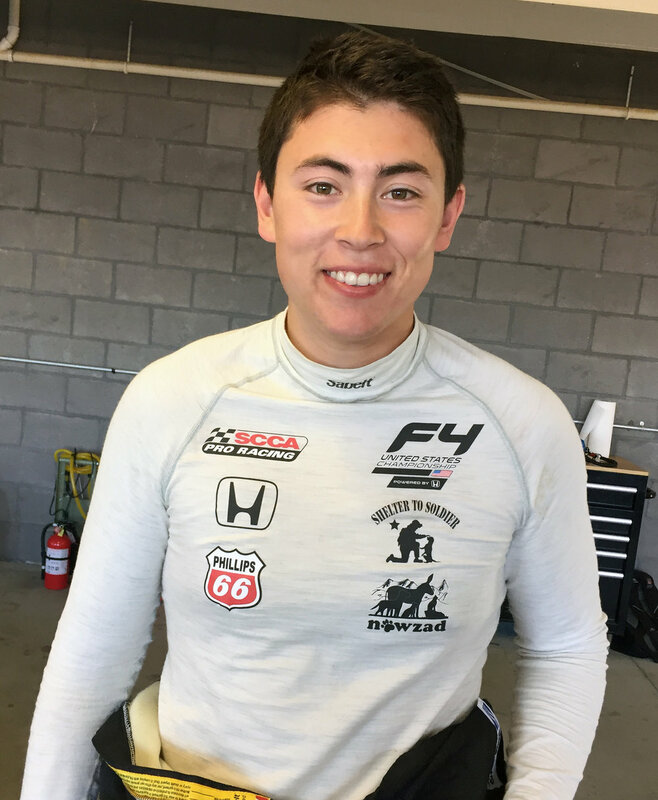 In his first two years of racing cars he won a Driver Development scholarship from Bryan Herta Autosport (2 time Indianapolis 500 winning team), a Karts to Cars scholarship from Skip Barber Racing School, was chosen to be one of two drivers to represent the United States overseas via the Team USA Scholarship and was the 2016 USF2000 Mazda Scholarship Driver. With this success, he hopes to continue on to the Verizon INDYCAR Series. Shelter to Soldier™ (www.sheltertosoldier.org)is a CA 501c3 non-profit organization that adopts dogs from local shelters and trains them to become psychiatric service dogs for post-9/11 combat veterans suffering from Post-Traumatic Stress Disorder (PTSD), Traumatic Brain Injury (TBI) and/or other psychological injuries associated with traumatic service experiences. Nowzad (www.nowzad.com) is an organization whose purpose is to relieve the suffering of animals in Afghanistan; including companion animals, working equines, stray and abandoned dogs and cats and all other animals in need of care and attention, by providing and maintaining rescue, rehabilitation and education facilities for the care and treatment of such animals with no voice. Nowzad carries out all the necessary checks and paperwork to get the dog or cat to their loving home, wherever it is, in the world. War zone rescues include Afghanistan, Iraq, Ukraine and Libya and the new homes for the animals include USA, UK, Australia, Belgium, Canada, France, Germany, Holland, Italy, Spain, Jordan Thailand and South Africa.